“As the civil rights movement picked up momentum in the late 1950s and early 1960s, Clark became notorious for his use of violent tactics and intimidation of African Americans. He started a fight with Annie Lee Cooper, a 54-year-old black woman standing in line to register to vote, that ended with Clark’s deputies holding her down while he beat her with a billy club. 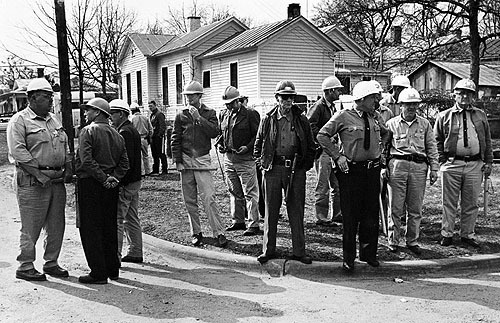 Clark and his deputies used cattle prods on black youths at a civil rights demonstration to force them to march until some collapsed or vomited from exhaustion. Claiming that any attempt to gain voting rights by African Americans was part of a plan for ‘black supremacy,’ Clark wore a small button reading ‘Never’ as a symbol of his opposition to black civil rights . . .
On March 7, 1965, the approximately 600 marches made it only six blocks before meeting state troopers and the Dallas County ‘sheriff’s posse’ led by Clark. On the east side of the Edmund Pettus Bridge, the law officers ordered the protesters to disperse and then advanced, making no attempts at arrest as they violently assaulted the marchers in 30 minutes of carnage that became known as ‘Bloody Sunday’. The troopers attached first with billy clubs, then tear gas. Clark’s posse rode on horseback through the confusion, giving rebel yells and attacking the protestors with bullwhips, ropes, and pieces of rubber tubing wrapped in barb wire. Fifty-six marchers were hospitalized.” – Encyclopedia of Alabama, May 14, 2009. 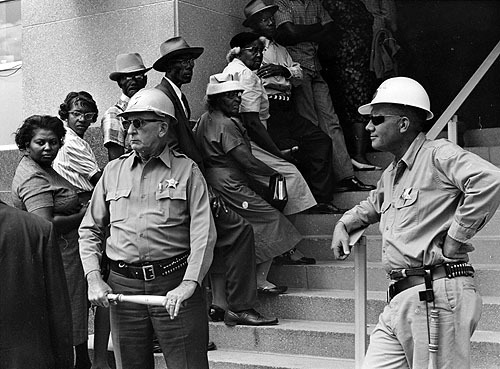 African Americans in Selma Alabama who wanted to register to vote were required to wait in a line on the courthouse steps for hours at a time without access to drinking water, food or restroom facilities and no one was allowed to talk with them. Any person who left the line was not permitted to return. These deputy sheriff’s were present to enforce the rules of Dallas County Sheriff Jim Clark. The county registrar was open only two days a month, so only a handful of these would-be voters would be registered. 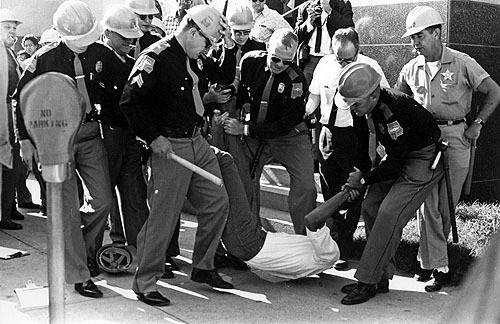 A SNCC civil rights worker is beaten in front of the courthouse steps by Sheriff Clark’s deputies. His crime? He dared to bring drinking water to African Americans standing for many hours in the hot sun hoping for the opportunity to register to vote. 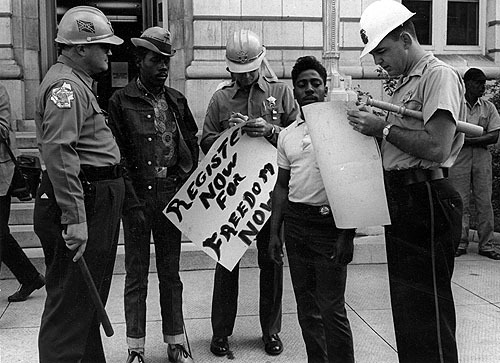 "REGISTER NOW FOR FREEDOM NOW"
Two volunteer civil rights workers are arrested at the U.S. federal building in Selma Alabama for urging people to register to vote. The decal of the confederate flag on the police offer’s helmet is meant to remind U.S. citizens in Alabama about which government is in charge. 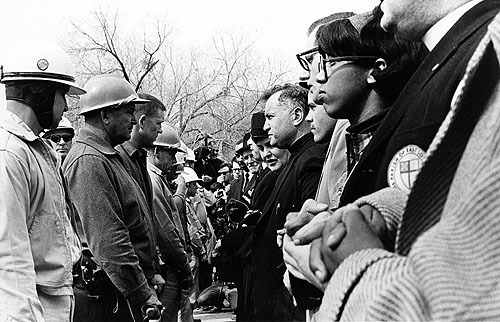 After “Bloody Sunday” – the first attempt to march from Selma to Montgomery to meet with Governor George Wallace that ended in bloodshed – Martin Luther King put out a national call to churches and synagogues to send representatives to Selma to prevent further police violence against African Americans who were seeking the right to vote. Hundreds responded to his plea. 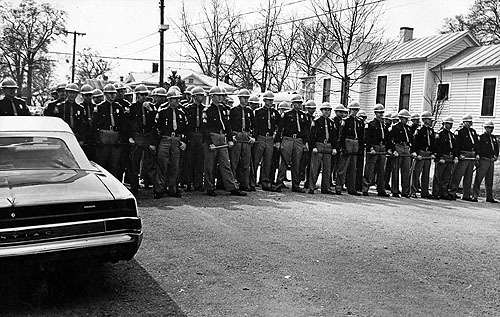 To prevent these supporters from marching into downtown Selma to protest the oppression and violence directed against African Americans, the police agencies built the “Selma Wall” to prevent access to the downtown area. A standoff ensued until a federal judge granted a permit for the historical march from Selma to Montgomery.